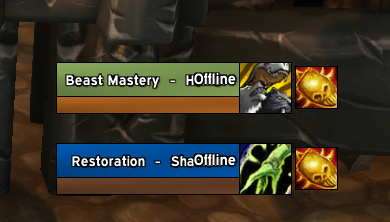 Arena Frames showing 'Offline' over other text in pregame. 'Offline' text does not show at all. 'Offline' text appears and overlaps the 'spec - class' text. This appears to be taking the place of health tag when in arena pregame, and presumably can't report a health value so shows as 'Offline' instead.